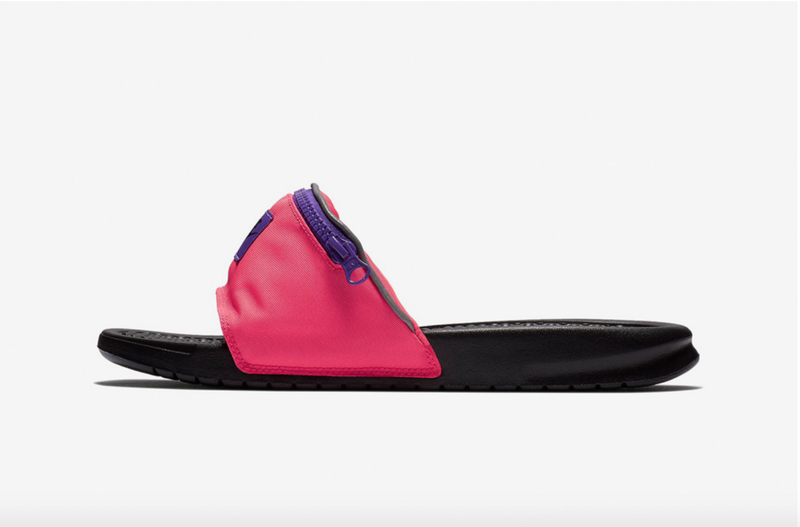 I guess we should have seen it coming: According to news outlet after news outlet after news outlet, the fanny pack (or “bum bag,” as the British would have it) is back, and it seems that we have Kendall Jenner to blame. 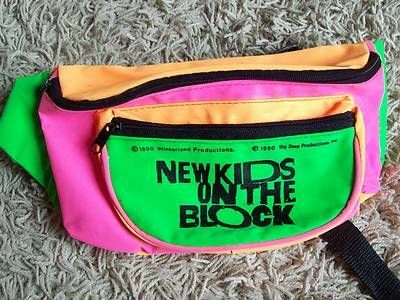 Now, don’t get me wrong, I don’t hate the fanny pack: I had one myself. 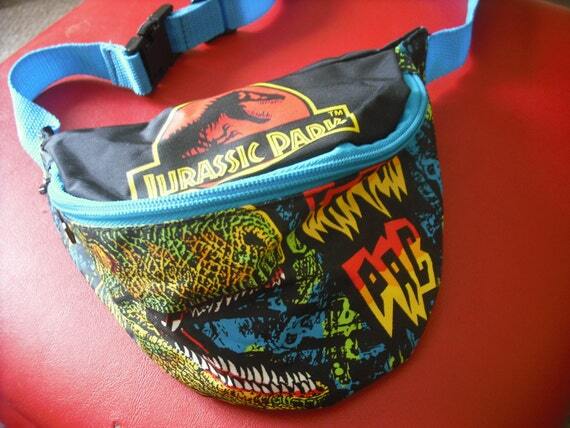 But to pull a quote from the tail-end of the fanny pack-era: “Dinosaurs had their shot, and nature selected them for extinction.” So said Ian Malcolm in 1993’s Jurassic Park, and the same sentiment goes for the fanny pack. Their time is gone! Let them stay in the late 1980s/early 1990s X-treme, neon hellscape they dominated. But they’re back regardless, and why wouldn’t they be? They’ve been around for almost as long as humans. Perhaps, like Malcolm’s dinosaurs, fanny packs, um, find a way. 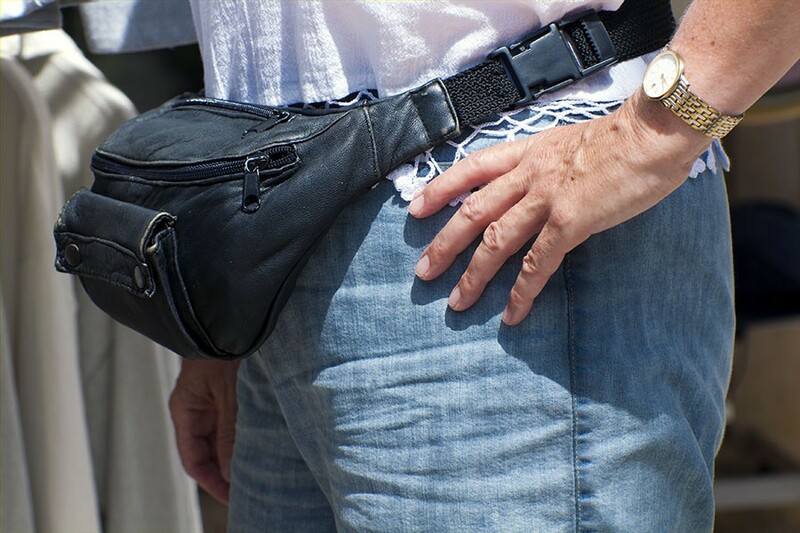 Now, if you Google “history of the fanny pack” or “who invented the fanny pack?” you’ll inevitably find a story that says it was invented in 1962 by an Australian widow named Melba Stone, who was inspired by the pouch of a kangaroo. This story is pretty widespread, with outlets like USA Today and the New York Times perpetuating it. But like all things that seem too good to be true (I mean, c’mon… a kangaroo?) this is most likely an utter fabrication. If you’re doing the math, this is eight years before Melba’s supposed kangaroo epiphany. That Sports Illustrated ad highlights how the fanny pack as we know it came to be, as its appearance is pretty much what you’d see today. 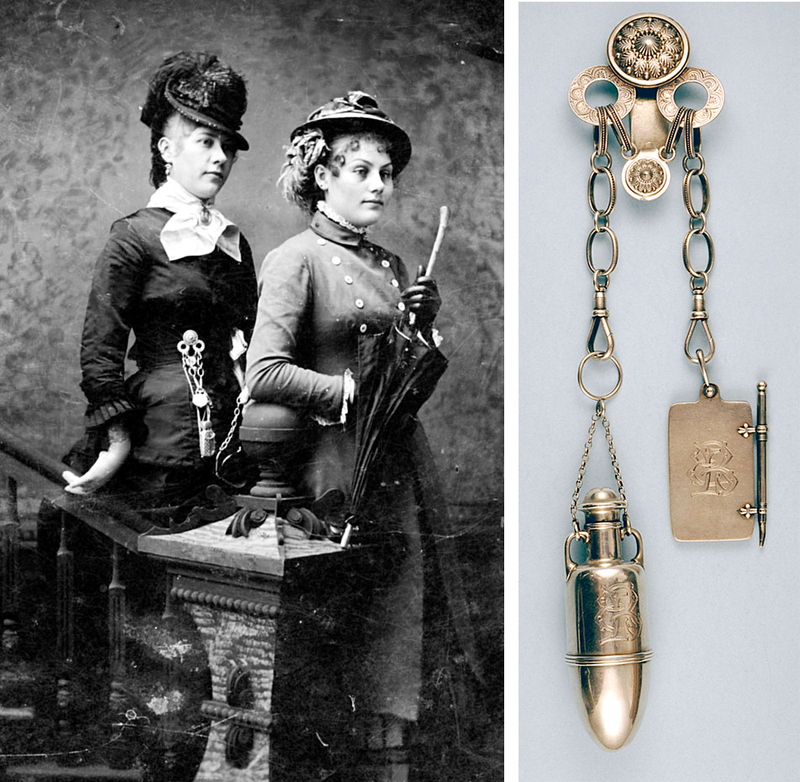 Back then, of course, they were used primarily by the aforementioned bikers, skiers and hikers, but fashion historian and author of Fashion Fads through American History, Jennifer Grayer Moore, explains that by the early 1980s, “We saw the first wave of ‘athleisure’ dressing, where things intended for the gym make its way to the streets.” So when sweatpants and track suits entered the mainstream, other sports accessories like leg warmers, bicycling sneakers, and yes, fanny packs also rode the wave. In 1988, Adweek named the fanny pack the “Hottest Product of the Year.” Soon thereafter, they appeared in Chanel ads being worn by Claudia Schiffer. 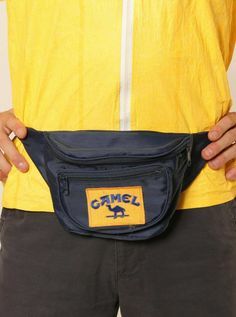 If you watch reruns of shows like Saved By the Bell, 90210 and The Cosby Show, you’ll easily spot fanny packs on one hip young character or another. This was true in music, too, with everyone from Public Enemy’s Terminator X to two-fifths of the New Kids on the Block wearing them at any given moment. It was also especially big for wrestlers like Hulk Hogan, and many others. (Of course, if you’re talking about wrestlers and fanny packs, you can’t not mention The Rock’s infamous fanny pack photo, which, to his credit, he recreated years later on SNL). It became a popular product to use for licensing as well due to it being cheap to make, useful and easy to put a label on. Go to eBay and type in just about any property from the late 1980s or early 1990s, and there will likely be a fanny pack of it: The Simpsons; ALF; Game Boy; and the New Kids on the Block, naturally. 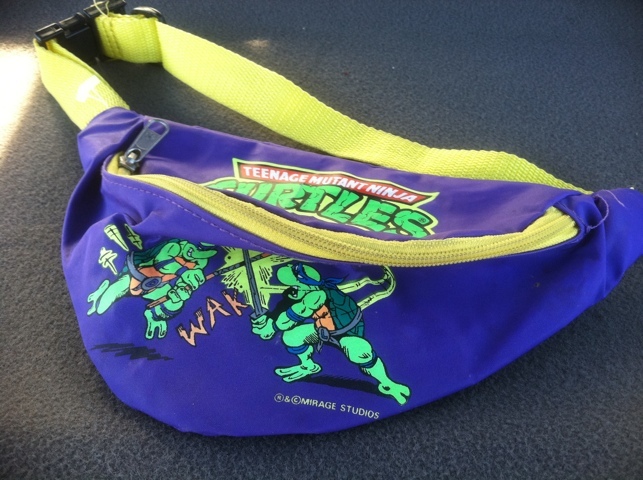 I had a Teenage Mutant Ninja Turtles one when I was in first grade, because of course I did. It was precisely these cheap, logo-slathered giveaway products that helped kill the fanny pack, says Moore, citing companies like Kodak and Camel cigarettes, which contributed to the demise. Before long, dads started wearing them to the beach — always a sure-fire sign that a trend is no longer, well, a trend. (Until recently at least.) Fashion historian Patrick Hughes cites the decline of the cheap fabric known as lycra as another contribution, but Todd Hanshaw, a stylist with decades of experience in the fashion industry, says that to understand the lifespan of any fashion trend, you just have to watch Meryl Streep’s “Cerulean Blue” monologue from The Devil Wears Prada. 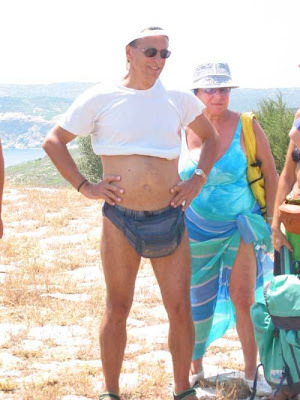 It wouldn’t be long before the fanny pack became the object of ridicule: As early as 1990, an episode of Seinfeld saw Jerry telling George that his fanny pack looked like his “belt was digesting a small animal.” By the early 2000s, the fanny pack as a fashion accessory was deader than dead, and still being mocked as late as 2006 in Weird Al’s White and Nerdy video. As Moore points out, though, the fanny pack never really disappeared — you could always buy one in your local Big Kmart, probably due to the fact that, as its original sporty wearers would happily attest, they’re pretty practical! 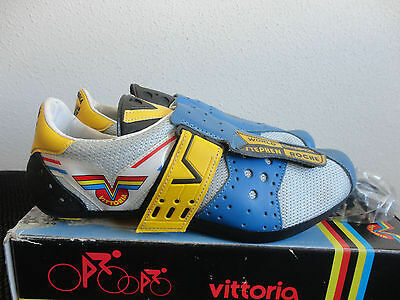 This, alongside the ironic hipster love of all things 1980s and 1990s (looking at you, Jared Leto) meant it was probably inevitable that they’d eventually find their way back into, if not our hearts, at least our beltlines. And once more, at no point in their resurgence does the story involve a kangaroo.